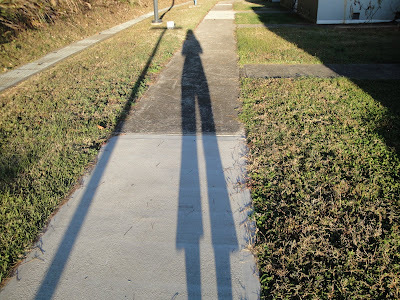 My wife's height is only 4'11" and she wants to be taller, so she got creative by taking a photo of her shadow. Happy shadow hunting everyone and have a blessed Sunday! I think she has my 5'9" frame beat...though there are disadvantages to being tall...you always have to reach the stuff on the top shelf for all the shorties...have a wonderful week and congrats little one on the smile contest!!! Great long shadows and lots of extra ones in the first photo! She is very tall now. Great shadow. You know I never think about taking pics of myself like this. I see them all the time and just have never done it.. I will try. Well your wife certainly got her wish! I'm also a shorty so I like seeing myself in tall shadowy form. Great photos! Am shorty too! u know how we look! he he... cuties though! Cool, I found a man who's married an asian. Hope you enjoy joining here. That shadow makes your wife look quite tall - about 7 feet or so! I'm 5'8" so I can't commiserate with her about wanting to be taller. 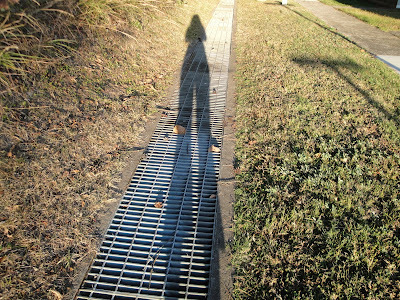 Fun super-long shadow! Reminds me of how someone looks up on stilts, but she's even taller. I think you are going to need elevator shoes to stand next to your wife, or a megaphone to talk to her! :) Rye thinks this height-reversal of her parents is funny, I think. Great shot! I have a slew of these 'tall' shots of me too! It's funny to see oneself stretched out like that, isn't it? A nice series of images and stories here. I enjoyed my stop! neat shadow....tell your wife she can be as tall or short as she wants on any given day...i've been from 5 through 7 feet...bring on the sun! Wow that's such a tall shadow! I have a family portrait of shadows, but we're only about half as tall as that! Great shadow shot! That sun must be slipping over the hill. I like to be taller too. Thanks for the idea of making me taller. I don't know if yellow is the colour of freedom, will check it out. I looked it up, blue is the colour of freedom. I had no idea rose is only 4'11 tall, i thought shes taller than me, im 5'2. smart wifey huh! cute post! It is really amazing how the shadow changes at the end of the day just before the sun goes down! now she looks taller than you are, joops :-)!